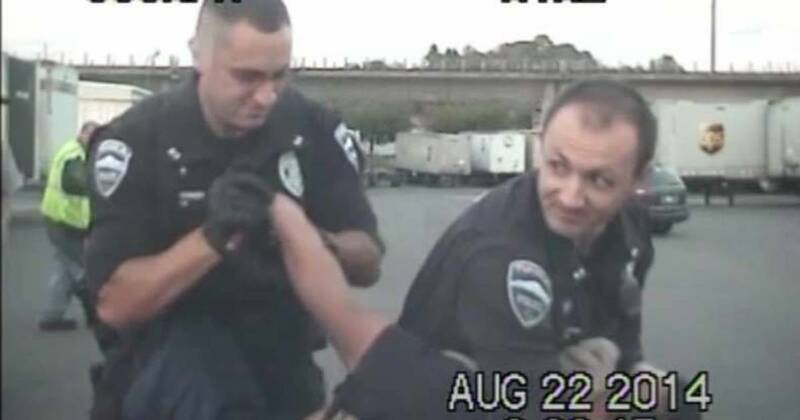 Tukwila, WA — A Washington man was just granted $100,000 to settle a civil rights lawsuit after police were seen on dashcam, repeatedly punching him, repeatedly tasering him, and allowing their K9 to maul him continuously in spite of appearing unconscious. On Aug. 22, 2014, the victim, Linson Tara was found dancing in a freight yard. Tara was not violent, and when police arrived, the dashcam shows him standing there with one hand on his hip and another in the air. As police attempt to walk Tara over to the vehicle, they quickly become violent. At most, Tara had merely pulled his arm away from the officer before he was placed in a headlock, slammed to the hood of the patrol car and beaten. Tara is entirely compliant; his arm is even seen limply falling to the hood of the car after the officer is seen attempting to break it. When Tara attempts to turn around, all hell breaks loose. Officers Brent Frank and Mike Boehmer are captured on the dashcam apparently smiling as they proceed to unleash their fury and their K9 on Tara, who appears to be entirely compliant. As Tara is slammed into the pavement, Frank is seen punching him in the face a half-dozen times. While he’s being beaten by Frank, Boehmer fires the taser at point blank range into Tara’s stomach and then repeatedly tasers him in the leg. As if this punishment wasn’t enough, the officers remotely released the K9 from its cage. The K9, Ace is then allowed to maul Tara. During this entire ordeal, Tara appears to be putting up no struggle. “On the video, it appears that Mr. Tara is unconscious,” the lawsuit says. When officers turn Tara over, he was indeed unconscious, which would explain the complete lack of resistance. How long he was unconscious during the arrest is unclear, although he appears to go limp after being slammed to the ground and repeatedly punched in the face. After torturing him with the dog and the tasers, Tara was brought to a nearby hospital to be treated for his multiple injuries, including several dog bites. After leaving the hospital, Tara was booked into jail and charged with three counts of fourth-degree assault on police. Yes, the officers who repeatedly punched, beat, tasered, and allowed a dog to maul a man — considered themselves the victims in this scenario. Luckily for Tara, however, these charges would all be dismissed after investigators watched the video. According to the lawsuit, as reported by the Seattle Times, Frank wrote in his report that he deployed the dog “to assist in providing pain compliance” to subdue Tara. None of these factors were present when these officers released the K9. As for officers Frank and Boehmer, they’ve yet to face any disciplinary action.